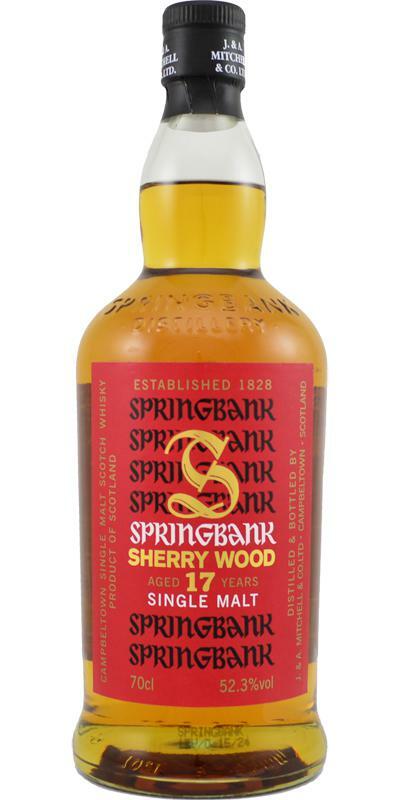 Over to Campbeltown this week for the newly released and much-sought-after sherrywood 17 from Springbank. Nose: Acrylic paint, dry paper, salty pork crackling, tangerines in syrup, coal-tar soap, nettles and damp moss. Palate: Mouth-coating with juicy peaches, gooseberries, raspberries, white grapes and elderflower cordial with a rising soft and tangy smoke through the middle. Develops further into crystallised orange peel with grapefruit. Finish: Sea salt and burnt caramel with gentle wafts of toasted oak and soft smoke. Water: Reduces the fruit and increases the smoke. Mmmm, now this is a lovely, (and atypical) sherried whisky. The nose is very savoury and meaty with a coastal edge, and the palate has some excellent fruit notes rising on a core of gentle smoke and oak-spices. The fruit notes, rather than developing towards the dark grape flavour profile (plums, raisins, cherries, christmas cake, chocolate, etc), lean towards the light grape flavour profile instead. It’s still an oily mouth-coater, but it’s more about the lighter and fresher flavours than the dark and rich ones. This is a very appealing and intriguing dram after trying so many other delicious (but ultimately predictable) sherried whiskies. Well done to Springbank for keeping things interesting! You can order a 6cl sample of the Springbank Sherrywood 17 from WhiskySite.nl for €12.49 – take advantage of the favourable exchange rate if you’re in the UK!